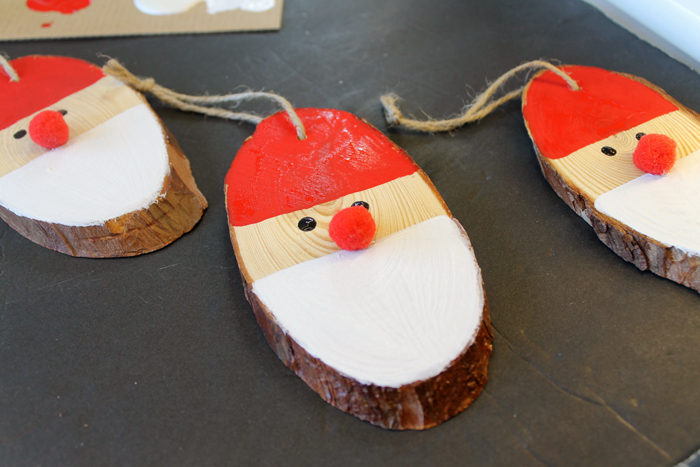 It is the last day of Craft Lightning and I am showing you how to make these wood slice Santa ornaments. Yes I am using wood slices again! I just can’t get enough of these rustic beauties this year. If you have missed any of the Craft Lightning fun, be sure to catch up with day 1, day 2, day 3, and day 4. Stay tuned for tomorrow as I wrap up all of the 15 minute crafts that have been shared this week. 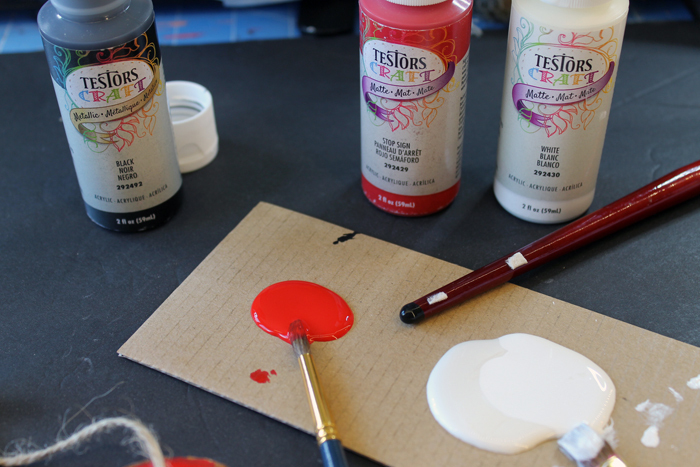 Please note that this post is sponsored by Testors however all projects and opinions are my own. 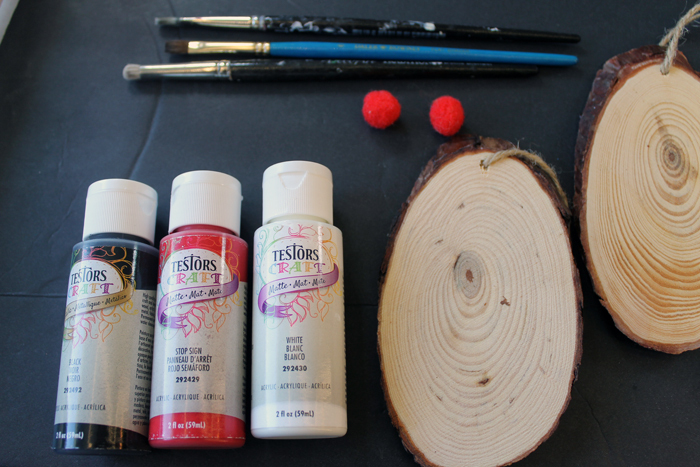 Start by painting your wood slice. You can see exactly how I made my version in the quick video below. TIP: For the eyes, you can actually use the wrong side of the paint brush. This will give you a circle without much effort. 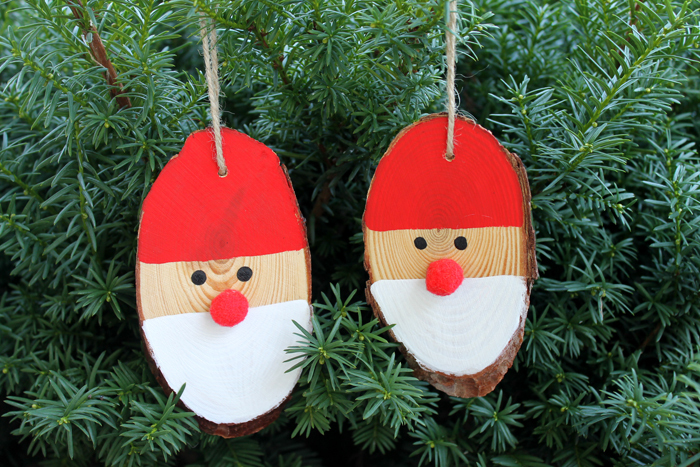 If you can’t watch the video, the process is simple for these ornaments. Paint the top of the wood slice red. Paint the bottom white. Leave the middle wood tone. Add the eyes with the black craft paint. Use a hot glue gun to add the red pom pom nose. It may take a few coats to get complete coverage especially on the white. 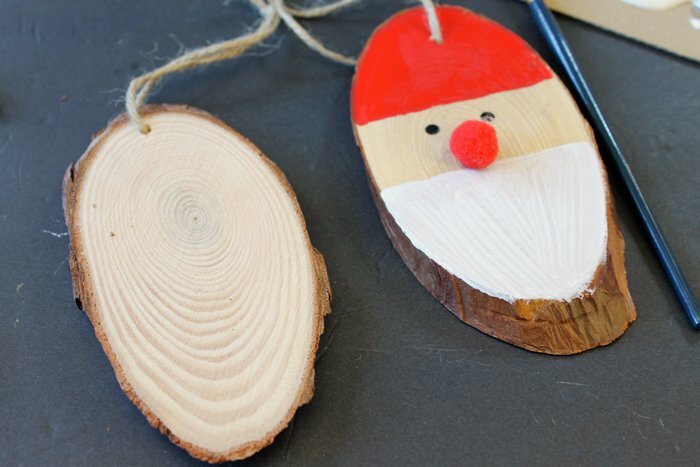 Allow everything to dry completely before adding these wood slice Santa ornaments to your tree. I love the simplicity of these rustic ornaments and how great they will look on my rustic farmhouse Christmas tree. 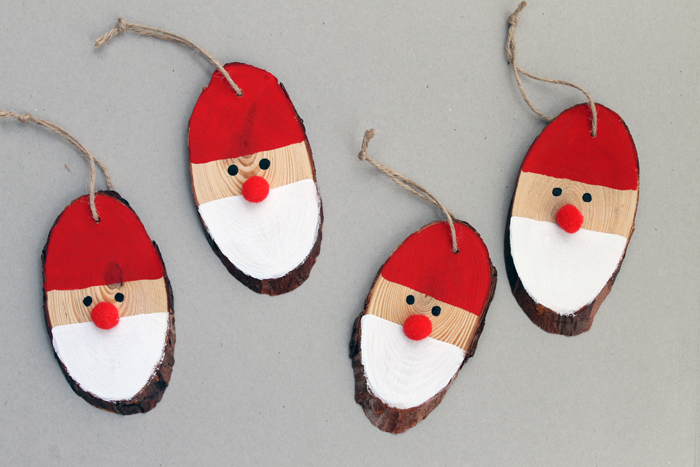 Add these wood slice Santa ornaments to your tree this holiday season! If you love quick and easy holiday crafts, you will love the 15 minute crafts from our blog partners below. 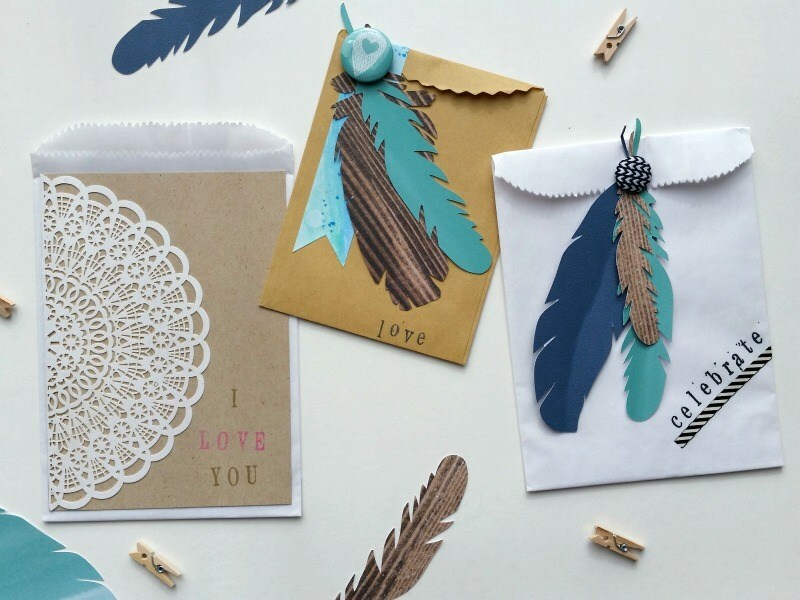 Start with this quick and easy gift wrap idea from My Craftily Ever After. 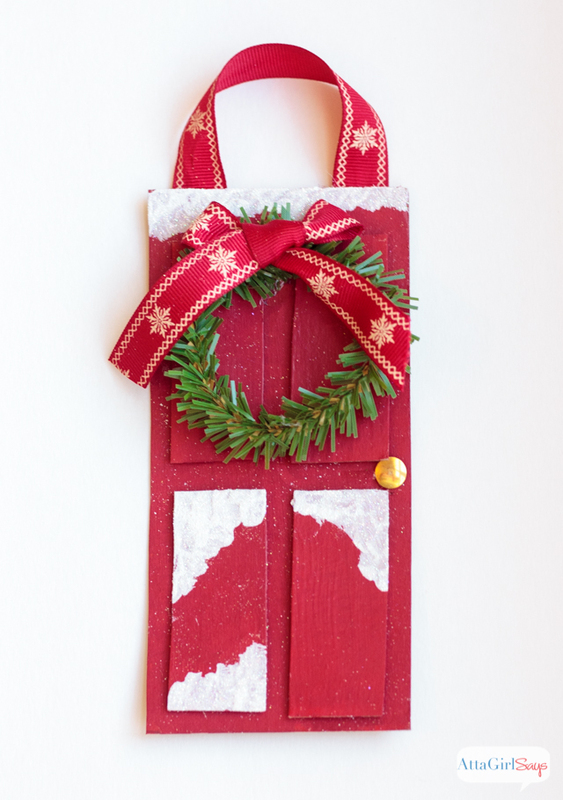 Make a cute little door ornament like this one from Atta Girl Says. 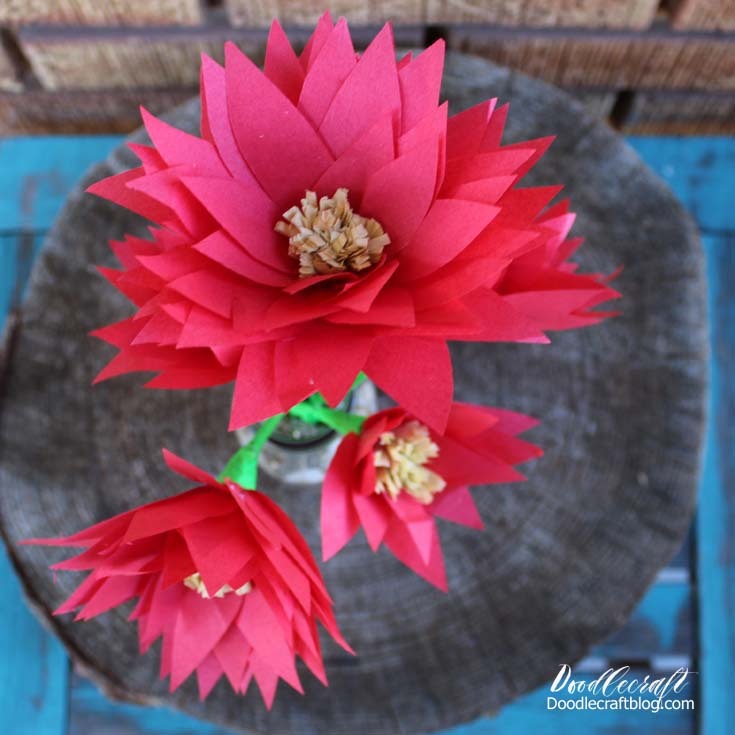 Doodle Craft is sharing how to make poinsettias from tissue paper. 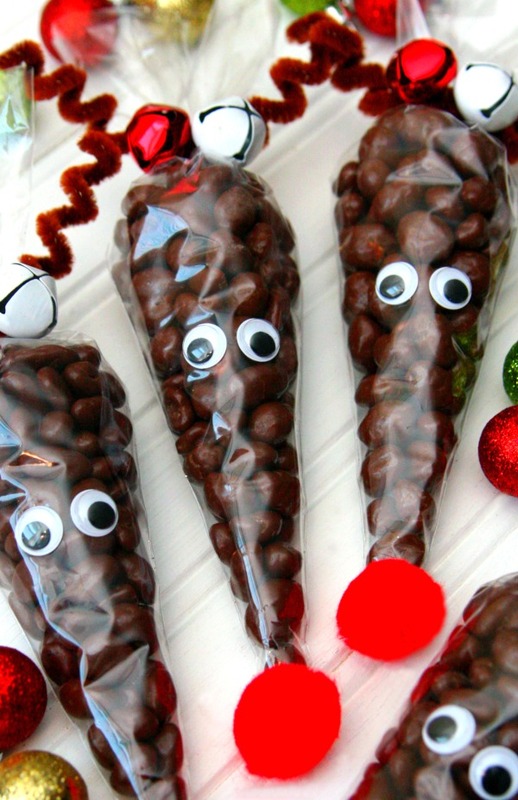 Give the kids some of these reindeer treat bags from Happy Go Lucky. 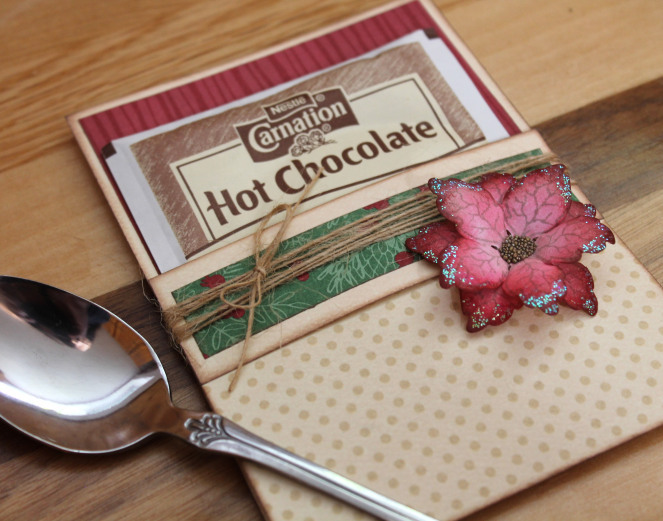 Scrappy Chick is sharing a fun way to gift hot cocoa packets. 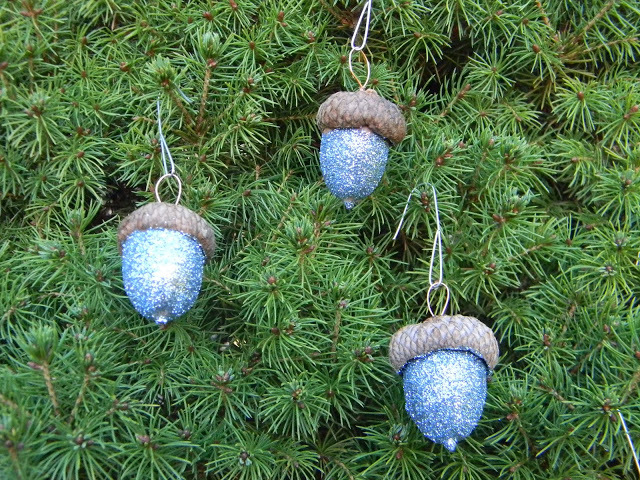 Make glittered acorns for your tree like these from Artistic Endeavors. 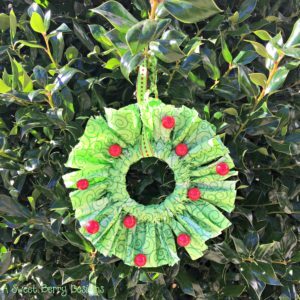 When A Sweet Berry gets a hold of it, a mason jar lid becomes a fun wreath with just fabric scraps. 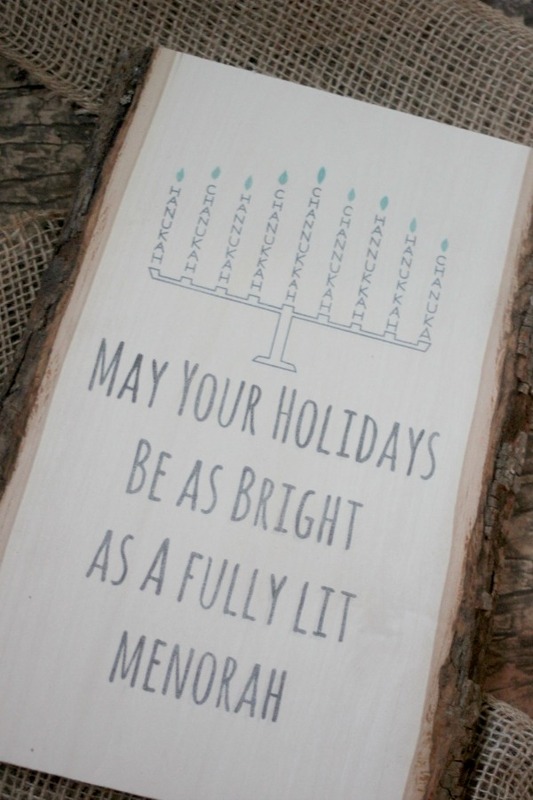 No matter how you spell it, celebrate Hanukkah with this fun ink transfer sign from Delicate Construction. 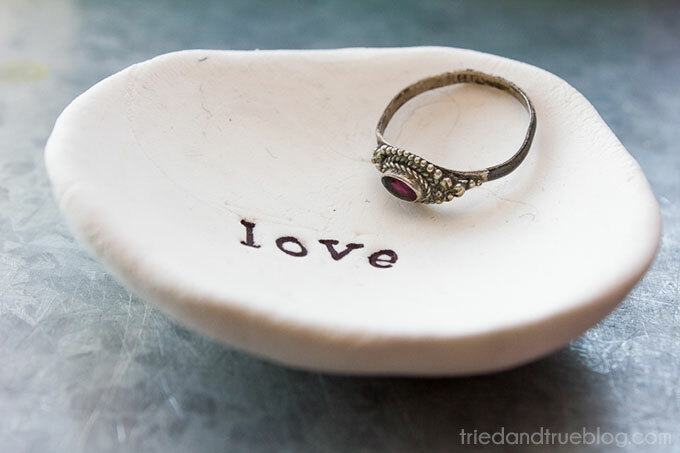 Our guest co-hostess is Tried & True blog and she is sharing how to make this handmade jewelry dish as a great gift idea. 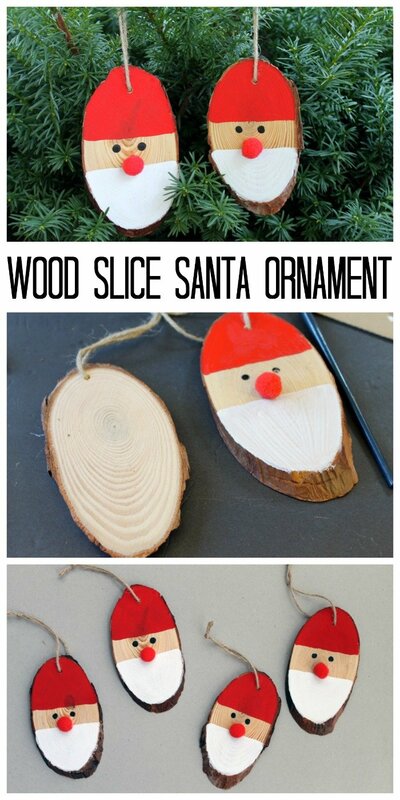 Make my wood slice Santa ornaments or any of these other quick and easy holiday crafts. Crafting for Christmas has never been easier!